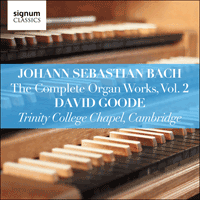 David Goode presents a second album in his cycle of the complete Bach organ works, once more exploring the sounds of the 1976 Metzler organ of Trinity College Cambridge. The striking pedal scale that opens the Prelude of BWV532 sets the tone for the piece—bold, original and arresting. Bach has taken the model of the North German Praeludium and surpassed it, creating a four-part piece whose bold gestures and harmonic daring remain in the mind long after the double-pedalling of the end has died away. The first part, announced by the pedal scale, features manual arpeggiation, setting out the key of D major. It is followed by an abrupt switch to B minor for a recitative of angular gestures over a static (dominant) pedal, before a virtuoso variation of the original ascending scale, spread over two octaves on the manuals, brings the original key back with similar abruptness. This heralds the start of the third section, an alla breve, Corellian in its employment of invertible suspensions, turning from North German keyboard idiom to Italianate string writing. The final section, balancing the D major-saturated first section with a dramatic and unstable harmonic language, is marked by diminished sevenths and ‘dark, anxious, unexpected minors’. The Fugue’s subject transforms the scalic opening of the Prelude into a figure that turns around the first three notes of D major, before spinning a descending sequential line reminiscent of the alla breve section of the Prelude. Alternating episodes, marked by more Italianate violinistic passagework, lead to a final entry and coda that emphasize D major in spectacular fashion, capped off by an elegant final bar that, whilst replaying the fugue’s subject, has no formal cadence at the end. This gentle manualiter chorale is based on the 1524 chorale text of Psalm 51, though its authenticity as originating with Bach has been questioned. The chorale melody, heard at the top of the texture, is set against a backdrop of subdued, pulsating quavers that project a sense of gravitas. The solemn feel is balanced by Bach’s harmonic language, which incorporates certain unexpected turns that suggest hope—the hope of divine forgiveness expressed by the psalmist. The sense of difficulties resolved, or guilt forgiven, is hinted at by the final cadential turn of the piece—an F sharp/E sharp dissonance resolved peacefully through an imperfect cadence onto an F sharp major chord. Two of the three movements of the Sonata BWV526 exist in later string trio arrangements, previously thought to have been made by Mozart, and the whole sonata may have had an earlier version for instrumental forces. The first movement Vivace is a dramatic ritornello that opens ‘like a concerto for two violins’; indeed, the style of the whole movement is that of string music. Its sequential writing, often containing jaunty chromatic inflections, contrasts with strong thematic material. The Largo, projecting a gentle and melancholy affect, offers two upper lines whose semiquavers and suspensions weave in and out of each other. The final Allegro combines a fugal and concerto techniques. Its first group is characterized by a rising, scalic subject in a solid duple time; its second by a striking semiquaver figure that throws the emphasis off the main beat. Prince Johann Ernst was Bach’s employer in Weimar, and a composer in his own right. Bach’s organ transcription of his G major Concerto dates from his years of service of Ernst in Weimar, specifically from after 1713, the year that the Prince returned from a two-year visit to the Netherlands, from where he sent Italian music back to Weimar for studying and copying. The surviving copies suggest a date of 1715 or later for BWV592: there is no autograph of the organ version surviving, though Ernst’s string original survives. The first movement is a simple ritornello structure in duple metre, with contrasting episodes in triple metre. Much of the writing exemplifies a style based on rising sequences, and Bach’s keyboard writing, with its melody-and-accompaniment and broken-chordal texture, is new in organ music of its time. The second movement is an Italianate slow movement, with a Vivaldian unison opening and close (compare the slow movement’s opening in Bach’s transcription of Vivaldi’s A minor Concerto BWV593) that brackets a delicately expressive melody. Ernst’s melodic line is ornamented, with basso continuo accompaniment that reaches an intricate five-part counterpoint at the climax. The final movement, also a ritornello, employs virtuosic string writing that translates well to the keyboard, with runs and fast repeated chords. The theme from Bach’s so-called ‘Corelli Fugue’ is taken from Corelli’s Trio Sonata Op 3 No 4 (1689). Bach’s work is of uncertain date as no autograph copy of it exists, but it reflects his keen interest in assimilating the music of other composers into his organ compositions. Bach’s treatment of Corelli’s original is very much his own, though there are more similarities with Corelli’s original than merely the famous opening. Bach’s work is marked by the use of a greater variety of figuration: one way that a sense of progression is achieved is through the tendency of the rhythmic values to increase through the piece, for example the gradual introduction of semiquavers into the counterpoint. Other striking features stand out: Bach’s richer harmonic language, often evident in the Corellian descending sequential patterns, and the tight use of stretti heard just before the subject’s final entry. The existence of two separate settings of this chorale reflect its popularity for Bach—there are fourteen settings through the composer’s oeuvre. BWV691 represents the more expressive of the two given here. It is a manualiter chorale, with the melody in the right hand given exacting ornaments above a simple two-part left hand that fills out the harmony. The floridity of the right hand’s ornamentation is expressive, yet an expressivity restrained by the sober feel of both the texture (simple three-part) and harmony (lacking the chromatic expressivity of other harmonisations of the same tune). In BWV690 the chorale is set in the soprano register, with diatonic harmony beneath, though the accompaniment is marked by more energetic figuration. The chorale receives a less expressive treatment (with fewer ornaments) yet within a frame of increased variation and creativity: a texture of four parts (at most), and the feature of a suspirans figure that gives a flowing rather than triumphant quality to the setting. The Prelude is in a ritornello form, the main theme consisting of three distinct parts: an ascending scale; arpeggiations around the dominant note; and fanfare-like semiquavers. The genius of the theme is its ability to combine with itself in all three parts in invertible counterpoint, a feature that generates the majority of the Prelude’s material. Thematic compression is also a quality of the Fugue, whose subject is masterfully compact. While only a single bar in length, it is able to combine many technical dualities: scalic and arpeggio figures; ascent and descent; major and minor modes; crotchet, quaver and semiquaver. Bach’s technical restraint is projected onto the architecture of the Fugue as the pedals are withheld until the final two pages, where they enter with the subject in rhythmic augmentation—a masterstroke!